Siddharth Desai, who scored 13 raid points was the star performer for U Mumba. 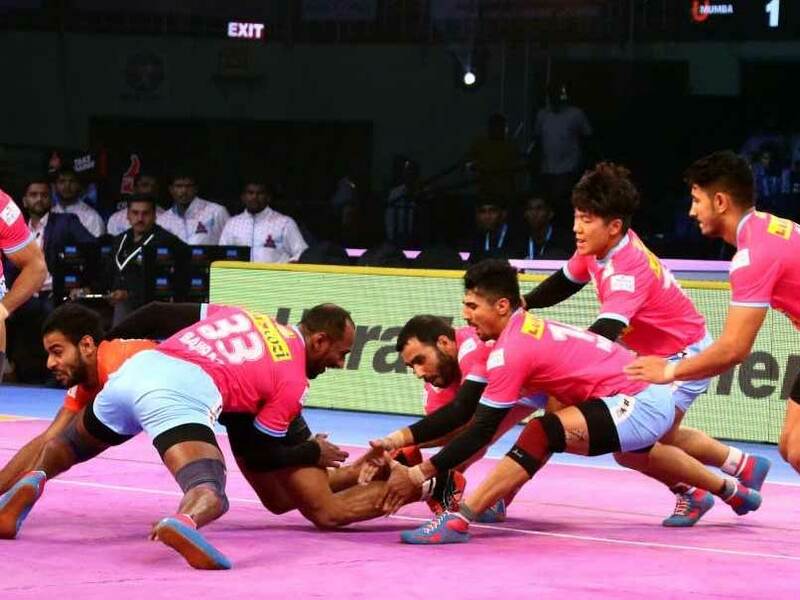 Siddharth Desai and Iran skipper Fazel Atrachali sizzled as U Mumba got the better of inaugural champions Jaipur Pink Panthers 39-32 in a see-saw Pro Kabaddi clash at the packed Jawaharlal Nehru Indoor Stadium on Wednesday. Siddharth Desai scored 13 raid points for U Mumba and was their star performer. Desai was ably supported by Rohit Baliyan who chipped with seven raid points. It was a disappointing first game for Jaipur Pink Panthers as they squandered a healthy first half advantage. Former India captain Anup Kumar had a quiet match as he scored just four points and Deepak Hooda too disappointed with just two points. Jaipur led 15-13 at halftime and looked the likelier of the two sides to win the encounter for large parts of the second half. But in the last four minutes, U Mumba turned the game on its head with an all out, leaving Jaipur trailing by eight points. 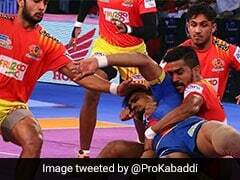 Jaipur could never recover from that as U Mumba completed a memorable comeback. Siddharth opened the account for U Mumba with a bonus point. Jaipur defenders then got a measure of Iranian raider Abolfazl Maghsodlou to level proceedings immediately. Deepak gave Jaipur the lead with a touch point followed by Abhishek Singh not helping U Mumba's cause with an unsuccessful raid. Jaipur opened up a three-point lead 2-5 soon after. The Iranian pair of Fazel and Hadi Tajik almost got the better of Nitin Rawal but the Iran skipper could not contain the all-rounder who managed to touch the line. With U Mumba trailing 2-7, substitute Rohit Baliyan reduced the margin by scoring a bonus and touch point before Jaipur inflicted an all out on their rivals to lead 11-5. U Mumba recovered after that riding Siddharh's five and Baliyan's three points to go into the break 13-15. Four minutes into the restart, Siddharth scored two raid points to continue U Mumba's revival but substitute Amit Kumar and Mohit Chhillar fashioned a super tackle to extend Jaipur's lead to 20-16. Abhishek Singh then raided successfully to make it 17-20 for U Mumba and with just two players on the mat for Jaipur -- Amit and Anup Kumar -- U Mumba inflicted an all out to cut down the margin to just one point. Nitin then pulled off an important super raid to take the lead to 28-26 for Jaipur after a spell trading points between the two sides. Anup Kumar then made it 29-26 before Jaipur called for a timeout with a lead of 30-27. With less than five minutes to go on the clock, things turned on its head as U Mumba first inflicted an all out and then forced a super tackle to lead 32-30. Rohit made crucial raids in the last few minutes to see off the tie. In the other match of the night, Bengaluru Bulls rode on raider Pawan Sehrawat's scintillating show to beat hosts Tamil Thalaivas 48-37 verdict in a one-sided tie. Sehrawat scored 20 points and did not let the opponents get a grip of the game. He was supported by Kashilang Adake (nine points) in attack and Ashish Sangwan (seven points) in defence.